Since 2008 Safelincs has been proud to support the Market Harborough Building Society (MHBS) with its initiative to send smoke alarms to every customer who takes out a mortgage. MHBS is a mutual, owned by its 50,000 members. As a small building society it prides itself on a personal service so often missing from large financial institutions. Sending a smoke alarms to each mortgage holder demonstrates a customer focus that has helped keep it in business since 1870. And it doesn’t end there. Every year thereafter a replacement battery is sent to ensure the smoke alarm continues to do its job. Safelincs handles the entire process invisibly. Each smoke alarm is shipped directly to the customer in MHBS branded packaging with a covering letter. It also sends the replacement batteries. MHBS sends an encoded database to Safelincs where it is held securely in memory storage off Safelincs own database. This keeps the mortgage holders information confidential and away from all other records. “We are pleased to be partnered with Safelincs in whom we are assured of a professional service for our customers at all times,” commented Julie Mottram, customer support manager, MHBS. Landlords frequently install main smoke alarm systems to BS5839 part 6 grade D in their premises. These smoke alarms should be regularly tested to ensure that they are in good working condition. Visiting the tenant regularly is not really an option, so how can you ensure the tenant is testing the alarm? The solution is easy – When purchasing smoke alarms from Safelincs, the buyer can ask for emailed or texted reminders to be send to a chosen email address or mobile number. Just choose your preferred frequency of reminder and Safelincs will take care of the rest. This service and how the tenant should act on receipt of a reminder should then be mentioned in the tenancy agreement. Safelincs are proud to announce that they have been invited to become a stakeholder in the Government’s Fire Kills campaign. The most recent campaign delivered the message ‘Pull Your Finger Out’ to encourage people to check their smoke alarms more frequently. To support this message in context with the relatively new online fire safety market, Safelincs will shortly be offering all their customers a free service to remind them when alarm batteries or smoke alarms are due for replacement. An additional weekly/monthly ‘have you checked your alarm’ reminder service will also be offered. 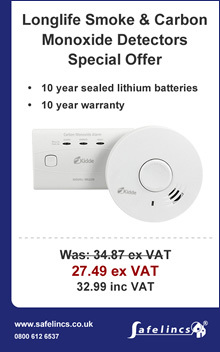 Safelincs offer a wide range of smoke alarms and a smoke alarm advice section is available.